After appearing in Battle of Waterloo in 2015, Luke Carroll returns to the Wharf to play Detective Flint in The Hanging. 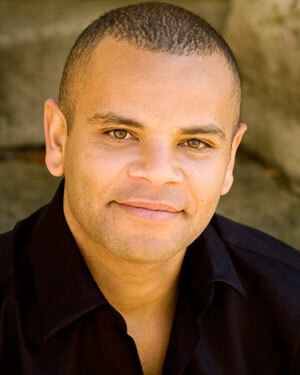 Aside from his work on stage, Luke is best known as one of the presenters on ABC's Play School. 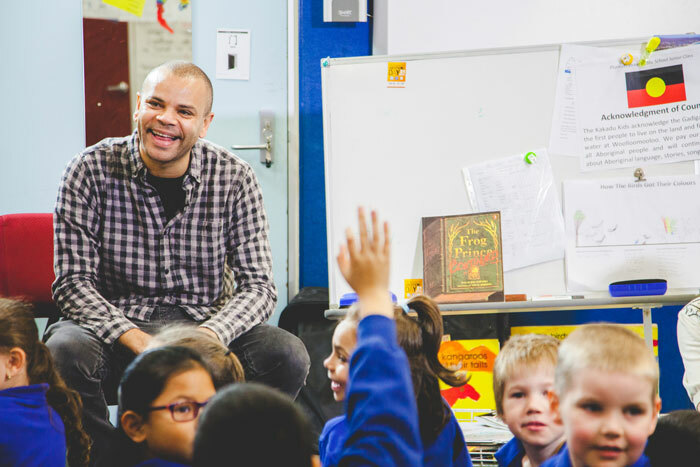 And, ahead of rehearsals for The Hanging, Luke visited his former primary school in Woolloomooloo to teach drama and literacy strategies as part of STC’s School Drama program. The students at Plunkett Street, who knew Luke from Play School, were understandably very excited to meet him. It was at school at Plunkett Street in Woolloomooloo and there was a relief teacher in Grade 3 who saw my potential. I was a bit of a class clown, I had a lot of energy, and she saw how that energy could be channelled outside the classroom in a really positive way… and that was acting. So, I remember she asked me to stay back after class finished one day and asked my mum to join. I thought I was in trouble, my mum thought I was in trouble, but that wasn't it at all. This teacher had a friend who was an acting agent and she set up a meeting for us. I went in there with no expectations and no real ambition to be an actor but I liked the idea of earning some extra pocket money and helping my mum out. She was a single mum with me and my older brother, so just being able to buy my own footy boots and tennis racquet was a great thing because I loved playing sports. So, I signed up with the agent and started out getting a bit of work as an extra on TV shows and learnt how it all worked technically. I got my first main role in a short film with directed by a student at AFTRS and then a guest role on Flying Doctors, which snowballed into a lot more work in TV. Soon after, I had to move to Melbourne for six months to shoot the show Lift Off, which was a great show and fun to do but it meant I was away from family and friends, working five-day weeks pretty much like an adult. We had a tutor on set, but there wasn't really much time for schooling. My mum has worked in education for decades, so she was worried about me missing out and, once I got to high school age, she pulled me out of what I thought was a blossoming acting career to focus on my studies. I still did a few acting gigs here and there, but nothing major. At the time, I thought it was the worst decision in the world. I mean, I was on TV sets having fun, earning money. But, in hindsight, I think it was the best decision she ever made for me. I'm very grateful for her foresight. After I finished my HSC, I didn't really know what I wanted to do (some work experience at a dentist's surgery had killed that idea). I went back into acting and I've been lucky to be consistently working ever since. What's it like to have been on Play School now for six years? It feels like something came full circle with that gig – I started as a child actor, education has been a key part of my life, now I'm helping to educate kids through my work as an actor, as a presenter. To work on such an iconic TV show is a thrill. It's great fun, but it's hard work too. The script often requires you to dance, sing and make something at the same time, all while presenting to an audience that isn't there. It was great to visit Plunkett Street primary school recently and interact with kids who have seen me on Play School. As for any teacher or parent, it's still a challenge to keep their attention, but it was great to have that connection with the audience behind the camera. Are you still connected to the school in any way? Not to the school specifically, but to the Woolloomooloo community, definitely. We have a reunion there every year in December, which people travel to from all over Australia. I loved growing up there. It's so central to everything and we had the bay right there. I remember the finger wharf, where Russell Crowe and John Laws live now, used to be this derelict thing. We'd jump the fence and run down to the end of the wharf and swim and fish, playing hide and seek in the whole Wharf. I have very fond memories. The suburb has obviously changed since I was there. When I went to Plunkett Street there were a few hundred students, with a big library that we loved, but now it's down to maybe 50 kids, with a lot of the buildings taken over by distant education offices. I guess a lot of the new, more affluent residents in the area prefer to send their kids to private schools. You lose some of that community feeling in the process. With The Hanging, how have you been finding your way into your character, Detective Flint? It's all there in the writing. Angela Betzien has created a really great piece of work – a thriller. Flint is there to solve the mystery. The scenes are really dynamic and intricate. There's a lot happening in what's being said and what's left unsaid, so it's been great to work with Ashleigh Cummings and Genevieve Lemon on the floor in rehearsal and go through the text with [director] Sarah Goodes in real detail. Sarah directed me in Battle of Waterloo last year, and I love working with her. Breaking the script down beat by beat to uncover everything that's going on – the mind games between the characters. It's exciting stuff.